The Prison Phoenix Trust is a charity that encourages prisoners in their spiritual lives through meditation and yoga, working with silence and the breath. From Monday 23 June to Friday 27 June, I trained to teach yoga in prisons, though a programme taught by the Prison Phoenix trust (PPT) and accredited by the British Wheel of yoga (BWY). I’ve been teaching yoga since 1998, and qualified as a yoga teacher in 2001. This intensive training enabled us to learn how to teach yoga, breathing practices and meditation in a way that was accessible to a range of participants and adapted to meet their needs, safely and effectively. 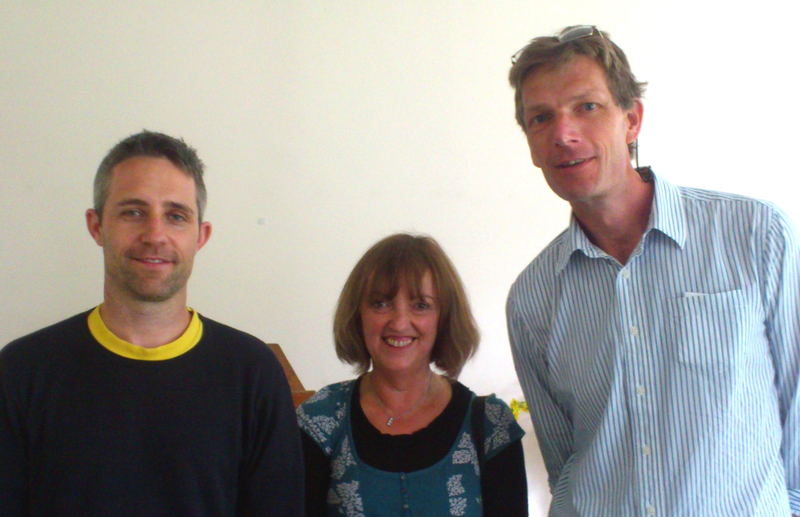 Brent Scott (left) and Sally Buxton (centre) are both Yoga Co-ordinators for the PPT. Sam Settle (right) is the PPT Director. They co-led the training programme. Since 2001, I have taught yoga and meditation in a range of settings, including private yoga centres, individual homes, adult education settings and schools. The participants have been from a range of ages, from 7 to 81 years, backgrounds and levels of ability from complete beginner to advanced. Yet this training prepared me for something different and altogether unique: to teach yoga and meditation in settings where the individuals there had acted in ways that meant not being allowed to participate in general society for a period of time. The 4 day training programme was wonderfully practical, informative and fun. There were speakers from prisons, including Prison Officers, ex-inmates and yoga and other teachers working in prisons, youth offending institutions, prison hospitals and other high security settings. There were talks, meditation and yoga sessions and discussion groups. We even had a bit of time to fit in a few walks in the beautiful Oxfordshire countryside and have an evening of games, singing and music provided by ourselves. We not only deepened our personal practice, though morning and evening practice sessions, but also our understanding of the complexities of the lives of those living and working in prisons. Overall, I gained confidence not only in how to adapt the teaching of yoga and meditation, but also in how to adapt myself to a setting in which security is of paramount importance. It was a brilliantly run and intense training course and I highly recommend it to any yoga teachers interested in such work. This entry was posted in Uncategorized and tagged British Wheel of Yoga, BWY, mediatation, mindfulness, ppt, Prison Phoenix Trust, prison yoga, prisons, Sam Settle, yoga on Jun 28, 2014 by Holistic Education. I agree Bernadette. Your blog post sums it up succinctly…I whole-heartedly recommend this course to other teachers.